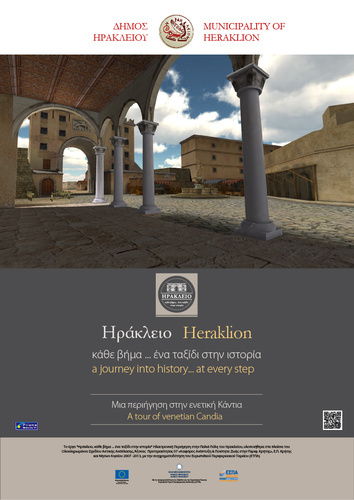 Heraklion is the Venetian, the Candia of 1640, enlivened through a dynamic implementation of virtual tour that allows the user (resident, visitor, educational community) to travel digitally through time and space and draw multifaceted and diverse information in Greek and English . The novelty of this action is that the screen of the portable user device is converted into a "window" in time. As the user moves the application within the old city limits, through specific routes, the Venetian Candia unfolds before him. By using the GPS, compass and gyroscope, the city with its monuments, whether there are still today or come to some other use or have been lost over time, brings to the user's screen. An "experiential" in physical space and real-time tour of the historic town center, through new technologies and photorealistic three-dimensional representations. Texts, photos, narratives, offer more information about the monuments or for any particular points. A modern electronic city tour guide for smart mobile devices (tablet, smartphones, android, iOs), where the user, depending on the interests and the time available, it has the opportunity to tour the city sights in an attractive aesthetic environment, with many photographs, texts and audio tour. For guests who do not have the required time, the "top ten" offers the most important sights of the city, while the "automatic audio guide 'informs them about the monuments located in their wake. By selecting "Museums", visitors have a complete guide of the city's museums and the surrounding area, while for those seeking the city's peculiarities, their suggested walks in areas of particular interest, points striking the city 'heart' day night. In the sections "Venetian fortification" and "Venetian Harbour", the user knows from near the town of Venetian rule, the Candia that was the capital of the kingdom of Crete. 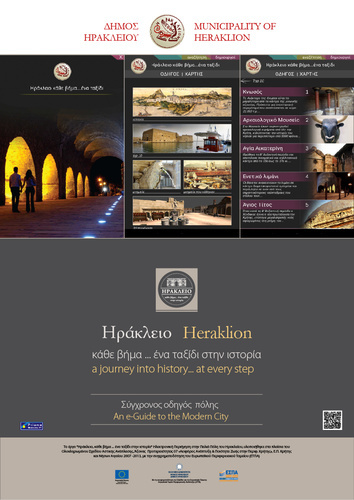 Get the most out of your city break with Heraklion Port Authority City Guide. Expert local knowledge in your pocket:. The app will help you track down the best bits on-the-go, featuring the lowdown on great museums, attractions, arts, entertainment and shopping for Heraklion. Roam free: best of all, the Heraklion City Guide app is fully operative offline, so you won’t receive any nasty, unexpected roaming charges. Online connection (3G, WiFi) is required in order to update the content or to use Google Maps functionality. The most complete and updated explorer assistant for Crete! The art of modern exploration on your mobile device! All Cretan Beaches in a single mobile application!